Earn $0.79 in VIP credit (79 points)What's This? The Ultra Sport II has an option for every rider. Coming in a wide variety of sizes, this tire is perfect for many different applications. Whether classic 23mm, increasingly popular 25mm, or wider 28mm tires are more your speed, the Ultra Sport II has got you covered. The excellent combination of grip and puncture protection will keep you rolling and enjoying the ride for miles. Across the range you get a supple 180 TPI casing and great mileage for the silica-based tread compound. The Continental Ultra Sport II comes in 700c x 23/25/28/32mm. Wire Bead. Black. For a reasonable tire with performance attitude, this tire cannit be beat. I have them on many of my bikes. I got the wire bead version of these tires for my electric bike, which came with really wide slow tires, because I wasn't concerned about how much they weigh. 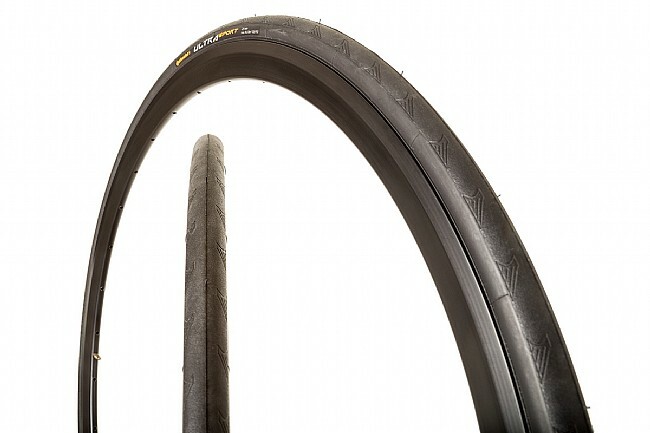 These look to have the same rubber as Continental Gatorskins, without the extra layer of flat protection, hence the significant difference in price. In my experience its possible to have flats with both. Happy with the thin tire size. Has held up so far (had it for 2 months), no flats even on a camping bike trip with lots of gear on my bike. Will have to see how it does over the long term for commuting. I've had these on for a couple of years. Wearing quite nicely, and they feel zippy to me. Good puncture resistance too. Not super great in wet conditions, but who would expect that from a seemingly groove-less tire. Rare tire size is no problem here, great products, great prices, ultra-fast shipping. Why look anywhere else? This is an excellent all-around training tire. Wears well, and seems fairly flat resistant. I usually shy away from wire bead tires as they tend to be hard to mount. These snap on fairly easy. The 180 TPI tire casing can't be found in another wire bead tire for this price. They are supple and have a nice ride, although you need to experiment with your PSI a bit. Mine feel nice around 105 PSI, although I ride mainly harsh chip sealed roads. As compared to the Vittoria Zaffiro II wire bead at 26 TPI (which I was using) these are a great improvement. (The Zaffiro's are a bitc to mount!!) Yes, I like pricey fold up clincher tires, but I ride in beer drinking country. I don't like replacing a fairly new expensive fold up that has a nasty cut because of glass. For the price you can't beat them. I use Continental since ever, almost 50 years now. It's just a tire you can depend on, period. It lasts 3,000 miles and I ride about 3,500 a year. Good for just riding on the wide open road. Very well constructed tire. Couldn't beat the price for this good quality tire. Tire split within the first 8 miles. Great value vs price ! I have been mounting my tires through the last few tire replacements with my simple DIY tools. These tires mounted much easier and faster than previous tires purchased. And when they are mounted, these tires preform very well.